Dead to Rights is the latest arcade style game from Namco that not only pays homage to the arcade games of yesterday but also to that of Max Payne. And what better way to hold you over till Max Payne 2 is finally released in Australia? In Dead to Rights, you play the role of Jack Slate, a tough and street wise cop from Grant City whose life is soon turned upside when he discovers his fathers dead body. Although Jack's father promised him that he was no longer involved in the shady underworld of Grant city, Jack soon discovers that his father was hiding more than just his good parenting skills. Denied access to his father's case, Jake must now sneak his way into the shady criminal underworld of Grant City that is filled with corruption and betrayal. 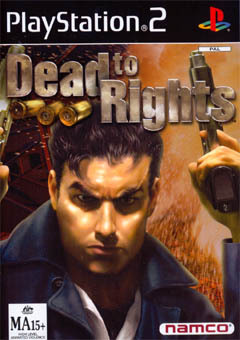 Although originally released on the XBox, Dead to Rights finally finds itself on the PlayStation 2 and fixes many of the bugs that were apparent in the original version. Dead to Rights has that classic Namco arcade feel to it and is a cross between Virtua Cop meets Max Payne. 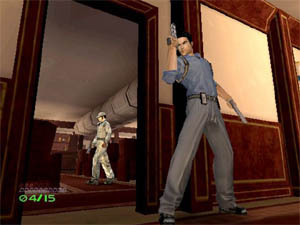 Apart from rehashing old stories of good cop, bad cop, Namco have introduced a very unique aspect into the game and that is of Jack's partner, Shadow, a K-9 police officer that sometimes steals the show. In its most simplistic form, Dead to Rights is an arcade game where you must complete certain objectives before you can finish the level. Fortunately for Jack Slate, he has access to a variety of weapons and when his weapons fail, he can then attack his opponents with hand-to-hand combat or use his trusty K-9 sidekick, Shadow. The game also contains a variety of mini-games that helps breaks the monotony of the arcade style game, these mini-games include a wide variety of objectives such as controlling a lap dancer's moves to distract a bouncer, so that Jack can sneak into the premises. It did take me awhile to figure out how to controller the dancer and it actually reminded me of Britney's Dance Beat or Space Channel 5. Other mini-games include arm wrestling, picking locks, disarming opponents and diffusing bombs. The game is also littered with a variety of equipment that Jack can use such as body armour and a plethora of military arsenals. The control system of Dead to Rights is a little tricky but fortunately you can get away with the basic manoeuvres in the game. 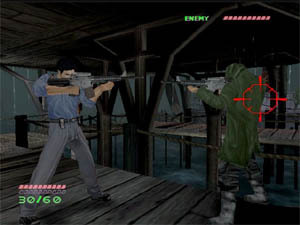 Jack can perform a variety of actions such as auto-aim, manual aim, duck, use objectives, use opponents as human shields, fight hand-to-hand, order Shadow to attack enemies, control Shadow and last but not least has the ability to use "bullet time" which brings back memories of the Matrix and Max Payne. Graphically, Dead to Rights is unfortunately a little dated and looks like one of the first generation of PlayStation 2 games. The gaming resolution of the game, even on the XBox version is fairly low, hence the jagged textures in the gaming environment. The characters themselves contain a fairly low polygon count but fortunately they have enough realistic textures to balance it out. Easily one of the most realistic characters in the game is Shadow who actually moves and sounds like a real dog. The game is also laced with some beautiful CGI cutscenes that truly helps bring the gamer into the shadowy atmosphere of the game. The game also makes use of some night lighting effects, some great Hollywood-style explosions and lots polygonal female lap dancers. The soundtrack of Dead to Rights has been professionally done and sounds like a Hollywood blockbuster that goes hand-in-hand with the action sequences to help increase your adrenaline. The voice acting of the game has also been professionally done and gone are Namco's trademark "bad" character acting. You can't help but agree with the heroic Jack Slate's accent who sounds like someone who is really annoyed and considering what he has been through, the character can only grow on you. 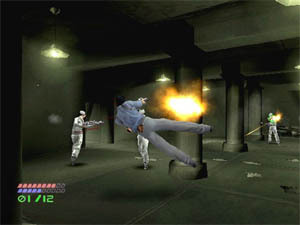 The game also supports a variety of professionally created sound effects such as a realistic gunshot sounds, huge explosions and various other sounds of Hollywood action movies. Dead to Rights is a very addictive game and the mini-games are spread nicely apart so you won't get too annoyed if you fail to achieve them from the first time you play. Although not the best looking game on the market at the moment, the gameplay of the game is really what makes this game come into its own, with its Matrix/Max Payne style of play. The game will probably take most gamers around 25 hours to complete but it's impossible to find everything in the game in one sitting, so you will be definitely playing this game a few more times. And with characters that you can relate too, Dead to Rights is the perfect game to keep you busy till Max Payne 2 is released. Check it out!